"For anyone involved with a business merger at any lever, this book is an excellent resource. It demystifies the merger process and the jargon, and provides readers practical, useful, and indispensible tools to improve the chances of a successful merger and a happy morning after. Excellent!" The Columbia Review. 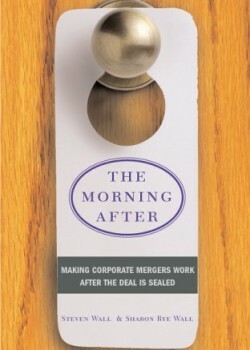 As the title hints, “The Morning After: Making Corporate Mergers Work After the Deal Is Sealed” explores mergers with a keen and realistic view of the days and months following the oft-euphoric corporate prenuptial courting, negotiating and merging. And while the discussions and examples are fascinating and insightful, the practical implications would be invaluable to anyone involved with a corporate merger. The authors share the wisdom learned not only through their extensive experience in helping post-merger companies, both large and huge, achieve success, but also the input and experience of numerous executives who reflect on their companies’ mergers—successful or not so successful—and share ideas on how to do better in ensuring the success of a business merger. “The Morning After: Making Corporate Mergers Work After the Deal Is Sealed” also adds a fascinating insight into the ‘multi-acquisition’ sprees of companies like Pfizer, Verizon and Cisco, which generated their own kind of challenges in the post-merger process. At the same time, the book provides excellent analysis and advice on integrating—not only the business units, but also the key employees and managers at every level. In this respect, “The Morning After” is truly unique and indispensible. In summary, for anyone involved with a business merger at any lever—entrepreneurs, junior and senior managers, executives, lawyers, bankers and consultants—this book is an excellent resource. It demystifies the merger process and the jargon, provides frank and down-to-earth explanations of various aspects of mergers and their highly challenging aftermaths, and hands readers practical, useful, and indispensible tools to improve the chances of a successful merger and a happy morning after. Highly recommended!